What is a 360 degree camera, even? Just think of a video camera that can capture literally everything you can see as well as what you can’t (unless you turned around in all directions, of course). Imagine being able to film an entire field of view and have the ability to move around the screen and look at what you’re in the mood for (some people call these virtual reality cameras due to this)? Cue these little gadgets. 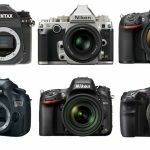 This may still be a relatively new and fresh subject, so naturally our love for video cameras made us want to look into this new piece of technology. Our top pick ended up being the a quite popular one, mainly due to the overall affordable price point (at least compared to others in this category) as well as quality it brings us. 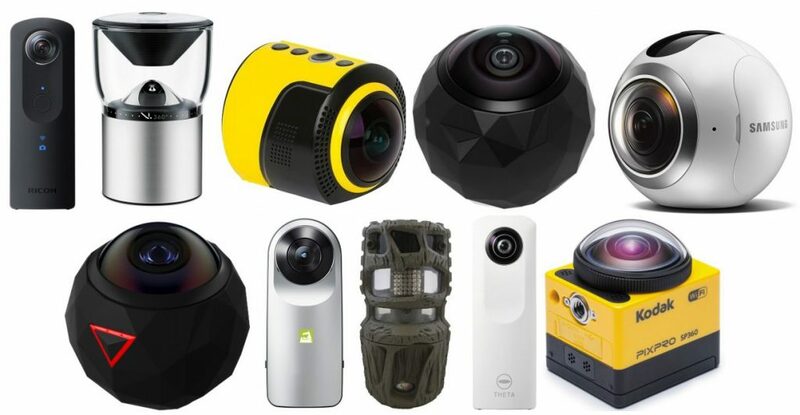 However, if you wanted some more options, today we review the top 10 best 360 degree cameras in the market. Let’s get started. What’s the big deal with 360 degree cameras? These 360 degree cameras may be the future, or could just be a small addition to the world of cameras. 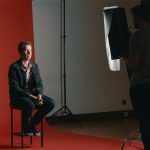 If you haven’t seen them already, they’re relatively self-explanatory — you’re attaining the ability to film all around you as opposed to our typical linear direction with video cameras. Better yet, and this was a surprise to us — some of us even allow the viewer to choose what they want to see by dragging around the field of view while watching the clip! 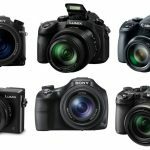 DSLR cameras for video still dominate the “typical applications” area for filming; however, we all have different needs and preferences — these may be the perfect solution for your filming and creativity needs. 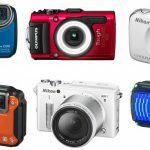 Some would call 360 degree cameras as action cameras (a few made it into our best action camera article), since they’re geared towards those who partake in activity-based applications, especially extreme and action clips due to a lot of their rugged builds. However, we wouldn’t let that steer you away when it comes to recommended applications of 360 degree cameras — we’ve heard of people filming sports, vlogs, skits, TV and movie clips, and more. 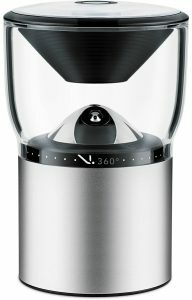 The 360fly HD camera is one of the first in the class we call a 360 degree camera. When these things first came out, we really didn’t know what to expect — until we saw the footage. Even so, with the clips looking great, how about the specs and features? Thanks to its solid build and essential features it offers to make it a great quality all-around video camera, this thing is a tank and is why we consider it the overall best. The 360fly HD comes with 1504 x 1504 resolution that takes photos and videos in a 360° x 240° field. It is also water-resistant, shock and dust proof while we’re at it (we’d hope so — it’s often geared towards extreme\underwater\snow sports). It has an internal 32 GB memory capacity and around 2 hours of battery life (can store up to 3 hours of footage). In the box, you’re getting a magnetic power cradle, USB cable, microphone plug and an action camera adapter for compatible 3-prong mounts. You also have an opportunity to simultaneously record, stream live and share with others all your videos. 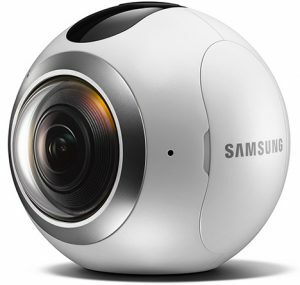 If you wanted one of the best 360 degree cameras in the market, check out the 360fly HD. Up next, we have another highly popular model in the market right now (made it into Gizmodo’s 360 degree camera test). The Ricoh Theta S is also considered one of the best 360 degree cameras thanks to its versatility and modern approach to 360 field of view recording. 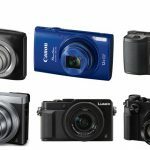 This high-quality camera comes with 1920 x 1080 HD (at 30fps) resolution that ensures some super clear quality of imaging and recording. 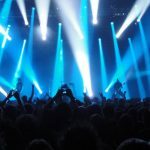 Although not nearly as long as the previous 360fly HD, you can record these videos for up to 25 minutes long (thanks to its 8 GB memory card) and instantly share and stream them online. What makes this a bit more expensive however is the larger sensor and higher-quality photos (12 megapixels). 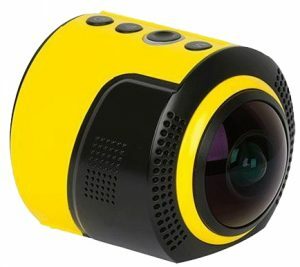 With the Theta S, you will also be able to convert them on the computer to different file types, including supported YouTube spherical video functionality (like the one above and being able to drag it around as you will). It also enables you to play with the quality of images and videos – you can correct white balance and exposure while you take photos or record. The Ricoh Theta S comes with a built-in Li-ion rechargeable battery for prolonged work and is top notch when it comes to the best 360 cameras in the market today. Samsung is well-known for the quality of its smartphones and other mobile products, so we’ll admit we had some expectations when it came to their spin on a 360 degree cameras; however, the Gear 360 definitely doesn’t disappoint and proves to be one of the best 360 degree cameras right now (if you have the budget, that is). Let’s see what we have here: CMOS 15 megapixel (two of them) image processor, F2.0 dual lenses (great for low light) at a resolution of a whopping 3840 x 1920, some time-lapse video 360 event logging, a microSD card slot (about 2.5 to 3 hours of filming), and a Li-ion rechargeable battery. For some protection, you can mount in versatile ways, and it’s also dust and water-resistant. It is easy and simple to use, has Wi-Fi connectivity, is lightweight and there is also a handy tripod that is easy to attach. Check out the Samsung Gear 360 if you want a top-notch model in terms of photo and video quality that’s also super versatile. 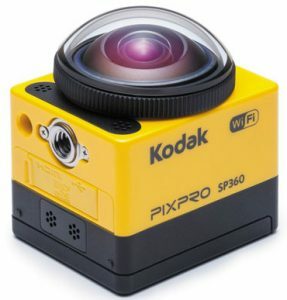 We were excited to see somebody as familiar with photo and video as Kodak is to come out with a 360 degree camera. Although a bit more cost-friendly than the previous models listed, the SP360 is still quite technically advanced and high-quality. It is equipped with a 16 megapixel sensor and high-definition video recording (1080p HD but only 10 fps). The SP360 is also dustproof, shockproof and water-resistant that makes it an excellent choice for recording and shooting anywhere and anytime – no need to worry about this camera, especially if you’re into filming in rugged terrain\sports. It can handle temperatures from -10 C up to 40 C and you can record and instantly share\stream photos and videos thanks to its Wi-Fi and NFC built-in connectivity. It comes with a rechargeable Li-ion battery and is super lightweight coming in at just 3.63 oz. As a plus, Kodak has made this one available in quite a few different accessory packs, so depending on your intended use you may be able to save some money and grab some mounts at the same time (one for extreme sports, explorer, and aqua sport).The Kodak SP360 is another one of the best 360 cameras out there, especially if you wanted to save a few bucks as compared to the previous three models. We decided to put this one right in the middle of our top 10 due to the cost; however, if you have the money and wanted to film in 4K with one of absolute best 360 degree cameras available today, here’s their flagship model. The 360fly 4K comes with a strong 16 MP image sensor and numerous advanced smart-camera qualities. It offers motion\audio active features and has the durability to handle many different settings and situations (non-slip\soft-touch coating). It is waterproof, shockproof and dustproof, so you can really take it anywhere to record anything you like. With 64 GB of internal memory, you can record for around 3 hours of filming (1.5 hours of battery life with this one) and then instantly stream and share videos and imaging (it has Wi-Fi and Bluetooth 4.0). This one also has a lot better brightness, sharpness and saturation than it’s predecessor. A few other highlights include a built-in accelerometer, gyroscope, e-compass and GPS sensors for geo-tagging (non-assisted). These features along with the 4K video resolution make it so expensive, yet so worth it if you’re into bells and whistles. Check out the 360fly 4K if you aren’t messing around when it comes to your filming. The LG 360 is proof that LG isn’t just an old brand who used to make cell phones (was also listed in Pocket-Lint’s best 360 degree camera article). If we had to choose one of our favorite budget-friendly, cheaper 360 degree cameras, here’s a great pick. 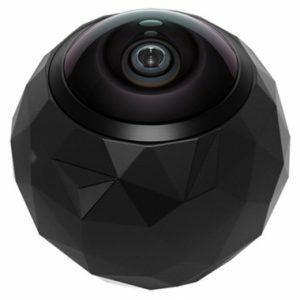 This model is pretty solid coming in at #6, and it comes with two 13 MP 360 degree cameras built-in (that pair up to give you the 360 picture) as well as a 16 megapixel spherical image for some pretty clear and sharp images\video. The LG 360 comes with a maximum resolution of up to 6480 x 1080 in HD, so although pretty solid, isn’t necessarily the beastly 4K resolution we’ve seen in other, more expensive models. There is an interesting time-lapse video feature where you can capture sequences in lapses from 2 up to 60 seconds and at the end of it all, is simple and easy to record and share\publish your videos\photos on social media. It stands out due to the super small size (fits like another smart phone in your pocket), convenient app-control as well as affordable price-point. Take a look at the LG 360 if you wanted to save a few bucks on your 360 degree camera and were fine with sacrificing some quality and features. The VSN Mobil V.360 definitely sports a different look than many others in this guide, but that’s all for a reason. It is one of the best options for security purposes due to its built-in motion or audio detector that will automatically turn on the recording function. You also have some dual microphones built-in for better audio quality than others (none of these are too impressive when it comes to sound), a GPS, barometer, altimeter and accelerometer to track those unique data points you’ll be coming across. You can control it over your smartphone thanks to its built-in Bluetooth remote control and with wi-fi connectivity, you can share\stream videos and photos pretty easily (you can use the USB cable to do this direct as well). You can increase the memory up to 128 GB for prolonged recording and a decent amount of photos to shoot (the battery gives you about 2 hours of recording). This camera is also waterproof (up to 3 ft. of water for 30 min. ), dustproof and shockproof. Who knows, the VSN Mobil V.360 may be the perfect option for what you were looking to use it for. Here is another one of the best Ricoh 360 degree video camera models and this one’s quite a bit lower priced than the previously listed model. It is simple to use and lightweight (under 100 grams) but technically advanced and capable. You have the ability to shoot videos for 5 minutes in 1920 x 1080 HD quality and spherical videos up to 3 minutes (we know, not too long, but we’ll take it). A memory card of 4 GB enables you to have a decent amount of storage (for such a small size, at least). For extras, the app has a video tool to let you customize your clips a bit — size, shape, composition and a little more. It also has some Wi-Fi transfer to avoid cables as much as possible like many others within its class. The Ricoh Theta M15 also comes in 4 colors, which is never a bad thing for those are into aesthetics. Here is a little gem we came across when sifting through some of the lesser known brands. 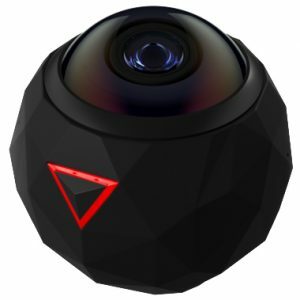 This is a lightweight and small model (only 2.7 ounces) with a surprising amount of essential features and elements of an all-encompassing spherical 360 degree field of view camera. We have 8 MP with 1080 HD imaging for average image quality. The camera comes with a built-in Li-ion rechargeable battery for reliable lasting functionality. With built-in Wi-Fi connectivity, you can instantly share and stream your photos and videos online and a memory card of up to 32 GB in the camera a solid number considering the size. There are also different view modes for some creative imaging options: panorama, fisheye, hemisphere or planet lens. It of course has it’s own app as well (need it as the viewfinder). The DETU Wireless 360 is a great choice for those who wanted the raw features a 360 degree camera should have at a pretty affordable price. Here’s something a bit different in the area of the best 360 cameras (or at least in regards to the looks of it), but definitely worth placing in this guide. 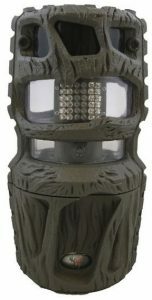 By first glance, you’ll associate this thing with some outdoor, nature uses (mainly due to the camo color and shape). Despite the low price however, the Wildgame Innovations R12i20 is an infrared 360 degree camera that comes with 12 MP resolution photos and HD video quality (video recording quality is up to 720p in clips of up to 30 seconds). It is water resistant so you can use it for some underwater or near a lake shooting and with 1 pound weight, it won’t hurt to carry around (ie: a long hike, trip, camping, etc.). You can add up to 32 GB memory on the SDHC card and it comes with a T-Post mounting bracket for easy and convenient usage (indoors and outdoors). It is powered by 8 AA batteries (not included in the box), so you’re not getting a Li-ion battery with this one — that may even be a plus, considering if you’re outside without an electrical outlet to charge it back up, you can easily replace them with some spare AA. Check out the Wildgame R12i20 for something very specific, yet perfect if it fits your checklist.